Tokyo ISP Global Online Japan. Opportunities for foreigners and Japanese alike have never been greater than in today's Japan. But it wasn't always like this, and certain netpreneurs were here at the beginning. Roger Boisvert-founder of Global OnLine-is one of them. E-commerce -- Japan at the Ready? E-commerce in Japan is set to take off. But from gerontratic corporations that just don't get the Net to laws against discounting books, any would-be Amazon.co.jp has to jump not a few hurdles before making it to the finish. Rakuten, the operator of Japan's biggest online shopping mall, starts business each week with a regular Monday meeting at 8:00 a.m. All employees attend and report the current status of their projects in 60 seconds. 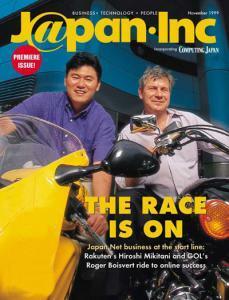 For Rakuten's president, Hiroshi Mikitani, speed counts more than anything on the Net. Commodore Perry's Black Ships cruised to Japan at a snail's pace. Today, the Net is blazing a much speedier path, and it looks like consumers and businesses stand to gain. Net service on your cellular telephone and cheap access via the power company, here we come! A new wave of young but savvy netpreneurs are surfing right over the reefs that are ripping the guts out of Japan's traditional businesses. They move fast, they think "Net," and they won't put up with the red tape and ministerial "administrative guidance"-long-term hallmarks of this country's stolid business climate. Japan's cops are getting smarter, but only some of them. In the Internet age, how can a bank-with no credit card service to call its own-tap into the online boom? Easy, says Sakura Bank, one of Japan's behemoths. The answer is to create a virtual bank. What's So Funny about a Teddy Bear, the Internet, and a Little Understanding? At last, Japan-based Net startups have found their angel. For too long, Net companies looking for funds have been forced to look to individual investors or outside Japan, but one company has finally stepped forward. The company? The ever newsworthy (this summer anyway) Softbank Corp.
How Japanese Spend Their Time.